Luxurious, stylish and exhilarating, the 2018 Jaguar F-PACE in San Antonio, TX is a fan favorite in just its second year of production. With a sleek crossover design that provides thrills for five passengers, the Jaguar F-PACE is a welcome addition to the Jaguar brand. Already a power-packed luxury crossover, the 2018 Jaguar F-PACE adds a turbocharged four-cylinder powermill to its arsenal for the new model year to go along with advanced safety systems and an innovative Jaguar In-Car Payment App. When you opt for the 2018 Jaguar F-PACE, you will have the choice between five fully-loaded trim levels - F-PACE, Premium, Prestige, R-Sport and S - that can be tailored to fit your lifestyle. A base MSRP that stands at $42,065 provides limitless thrills and unrivaled luxury at an affordable price. Armed with a spacious cabin that fits five passengers and adds an impressive 33.5 cubic feet of cargo space, the Jaguar F-PACE will turn family adventures into a luxury cruise when you get behind the wheel. Car shoppers who approach the 2018 Jaguar F-PACE in San Antonio, TX want to know - what’s under the hood of the Jaguar F-PACE? 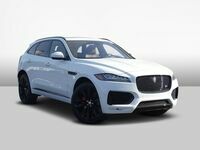 An all-new base powertrain highlights the sophomore year of the Jaguar F-PACE with an Ingenium 2.0-liter turbocharged four-cylinder engine that shells out a fun-to-drive 247 horsepower and 269 pound-feet of torque. With a top speed of 135 mph and a zero-to-60 mph time of 6.4 seconds, the new powertrain promises plenty of thrills. Are you looking for an upgrade in power? Jaguar F-PACE models will upgrade performance and fuel economy with a 180-horsepower 2.0-liter turbodiesel four-cylinder engine that will make 26 mpg in the city and 33 mpg on the highway. Still looking for more power? Opt for the 340-horsepower 3.0-liter supercharged V-6 engine and you will sprint from zero to 60 mph in just 5.4 seconds with a top speed of 155 mph. 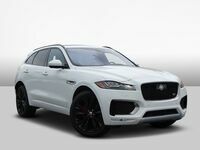 When you select the Jaguar F-PACE S trim level you will experience the benefits of an amplified 380-horsepower 3.0-liter supercharged V-6 that will vault from zero to 60 mph in 5.1 seconds. Loaded with high-end features, the 2018 Jaguar F-PACE checks all the boxes. Standard fixtures on the Jaguar F-PACE spec sheet include 18-inch alloy wheels, a panoramic moonroof, a 380-watt Meridian™ 11-speaker sound system, a power liftgate, a Jaguar InControl Touch eight-inch touchscreen display and access to Apple CarPlay. Upgrades include premium leather interior, heated seats and advanced safety systems that include Blind Spot Monitor with Closing Vehicle Sensor, Reverse Traffic Detection, Emergency Braking and Lane Keep Assist. 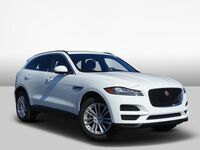 Learn more about the 2018 Jaguar F-PACE when you visit Barrett Jaguar in San Antonio! 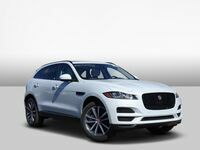 Interested in a 2018 Jaguar F-PACE?